Good trim and woodwork tend to disappear to the untrained eye. When the decorative finish is properly balanced in proportion to the size and shape of windows and doors, as well as relative to ceiling height, the completed look tends to escape notice. Poor trim work (and in some cases, a lack of trim work), however, sticks out like, well, rather like a limb on a tree. We chatted with our friends at Central Woodwork and have trimmed down their tips for you today. We wood like to guarantee that you won’t be board reading this article, but we’ll keep today’s discussion trunk-ated, just in case. Okay, that’s it, we’re done with the puns, promise! Cole Stant and his crew at Central Woodwork know what they are doing. Their team has a keen eye and intimate understanding of what will suit your home when it comes to trim styles in a way that their well-known national competitors (affectionately referred to by the Central Woodwork team as “Big Blue” and “Big Orange”) simply do not. Our biggest takeaway? 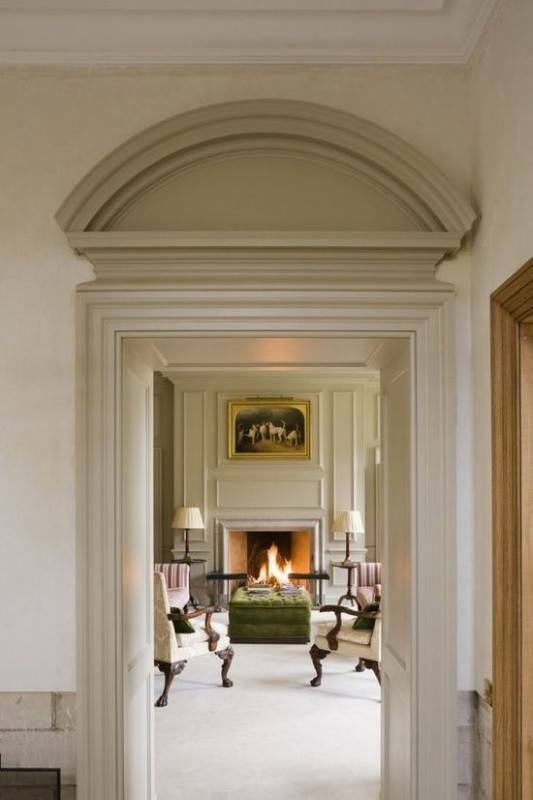 Trim is a compelling feature in interior design, but balance is essential to aesthetic success. The following photos are computer-generated, but they give you an idea of how big a difference trim can make in a space. Trim does make a tremendous difference in the appearance of a home. But choosing the right trim for a space is not an easy decision. There is an element of being stuck with the style of your home in terms of selecting trim. In chatting with Cole and his team, they broke down Nashville homes into a few broad categories, citing their recommendations for trim within each space. Exposed brick, visible pipes, concrete floors and the vintage feel of a warehouse space have all made their way into contemporary interior design. There is a level of sophistication in the openness of rooms and space in these types of homes. According to Cole et al (and we at SB most certainly agree), traditional casing and ornate crown molding are rarely a part of that look. Generally speaking, these homes will have very minimal trim. These homes can be seen all over the country, and bungalows are especially popular in many Nashville neighborhoods. Known for their hinge roofs and tapered square columns supporting the roof in the front of the house, craftsman-style homes afford the opportunity for simpler trim. According to Cole, the more modern the home, the less trim you will see inside. Baseboards and shoe molds can be seen throughout these houses, but rarely will they have crown molding. Ranch homes allow many different trim options. While we can all recognize the style from the exterior for its long, close-to-the-ground profile, the interior can vary drastically from homeowner to homeowner. Though these homes traditionally are more informal and have minimal interior and exterior decoration, the style itself is flexible enough to use almost any type of trim. Neoclassical homes display a timeless architecture inspired by ancient Greek and Roman styles. The front porch, complete with two-story columns, and the symmetrical style exude grandeur. Interior design choices reflect that same style. There is a flexibility in what will work in such a home, and budgets and taste are obviously a deciding factor, but more ornate trim does seem to do well in this architectural style. To be fair, trim preference — as with most home design choices — varies from person to person and home to home. These examples, along with the expert advice Cole’s team offered, are meant to inspire ideas; it’s also important to be aware of what is already in your home. Trim types can be mixed and matched, but as with any design concept, there is an art to achieving an appealing aesthetic. Our SB Tip for today’s post? Don’t forget to see the forest through the trim. OK, that was really the last pun. Promise!